It’s been 8 years since Jack Wilshere made his Premier League debut for Arsenal as a fresh faced 16-year-old against Blackburn Rovers. Arsenal’s youngest ever player was earmarked as one to watch in the future, although diminutive in stature he had shown raw talent and technical ability which was unrivalled by many English midfielders of the same age. Fast forward 2 years to January 2010 and Wilshere was sent on loan to Bolton Wanderers for the second half of the 2009-10 season, joining the struggling Lancashire side as one of Owen Coyle’s first signings as manager. It was a coup for Bolton, in pre-season Arsene Wenger had compared the youngster to another of England’s great hopes when he said “he reminds me a bit of Wayne Rooney when he started, in his belief and in his positive attitude to go forward”. This was Wilshere’s opportunity to prove to Wenger that he could compete at Premier League level. And he took it. Wilshere successfully nailing down a first team place and became an incredibly important player in Bolton’s midfield, proving instrumental in leading Coyle’s men to Premier League safety. The following season saw the highly rated midfielder make the step-up to the Arsenal first team with a degree of success which was unexpected by many. He formed the bedrock of Wenger’s midfield, playing in a deeper, central role and making a total of 49 appearances over the course of the 2010-11 season. This was Wilshere’s arrival to the big time. The consistency and high level of his performances that season earned him many plaudits and placed him squarely on the pedestal as England’s new hope. The crowning moment came in the Champions League last 16 defeat to Barcelona. Particularly in the second leg of the tie, Wilshere was one of the best players on the pitch, showing a maturity beyond his years to dictate the game to an all-conquering Barcelona side lead by then manager, Pep Guardiola. 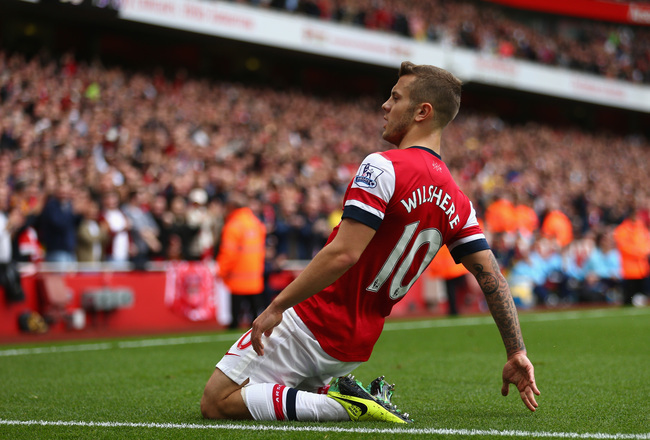 Wilshere more than held his own against world stars such as Lionel Messi, Xavi, Andrés Iniesta and Sergio Busquets. Hayward was right at the time, here was a player with all the requisite ability and vision to become one of the best midfielders in the world. Wilshere had proven himself a capable competitor and leading his team to 2-1 second leg victory over a team of World Cup and European Championship winners was no mean feat. He also picked up Arsenal’s Player of the Season Award, the PFA Young Player of the Year Award and made his full international debut for England all for good measure that season. Fast forward again to September 2016 and 24-year-old Wilshere is set to spend the 2016-17 season on loan at Bournemouth. The interim period between Barcelona and Bournemouth has been filled with a spate of serious injuries, inconsistent performances and public criticism of his personal life. In many ways, the comparisons to Gascoigne and Scholes are distinctly accurate. He is a player with immense natural ability, he’s spent time of the front and back pages of the papers but he’s also proved that he’s adaptable and on his day he can compete with the very best midfielders from across the continent. But where Wilshere has faced many struggles over recent seasons, there have also been some magical moments. The glorious team goal, instigated and finished by Wilshere against Norwich in 2013 is arguably one of the best goals in Premier League history or more recently the second of two stunners for England against Slovenia in the run-up to Euro 2016. Wilshere has suffered over the past few years with injuries and his “bad boy” image has most certainly been perpetuated by the press. Incidents from smoking in a Las Vegas swimming pool to brawls outside London nightclubs have sent the press into meltdown on several occasions. On a scale of Gascoigne to Scholes, you’ll find Wilshere sits firmly in the middle. He’s far from the fundamentally flawed genius of Gazza but he’s not the unassuming professional portrayed by Scholes and if anything, this makes him seem more real and relatable as a person in a world of hyper-celebrity footballers. What can Wilshere do to get his career back on track? On the surface, Bournemouth look like a perfect fit for Wilshere. Although, the Cherries are not the title challenging behemoths of the Premier League, Eddie Howe is creating a team based on a philosophy, playing attractive football and building a self-sustaining business. Changing the angle of the debate, Wilshere is a coup for Bournemouth and a sign of just how far they have come as a club. He could be be the player to take the Cherries to the next level and continue their ascent. But first things first for the England midfielder, assuming he can avoid injuries, regular football is key and a return to form vital for Wilshere’s Arsenal career. For now, let’s enjoy Jack Wilshere at his best. He’s a wonderfully skilled footballer and pray that he comes fully recovered. Agreed, I really hope he returns to the kind of form we saw in 2010-11! I imagine his brother could be a bad influence on him but young lads with money to spend, there will always be a fine line to tread.